How do you feel when an interesting TV program takes an unexpected commercial break and forces you to wait four to five minutes to get back to content you were engaged with? One thing mainstream media teaches business owners is that if you’re going to try and sell things to people you need to realise most of them are not in buying mode. You can’t expect success from irrelevant commercial messages shown to people who aren’t receptive. Social media is a perfect example of clumsy advertising by small businesses imitating a bygone era of mass marketing and the TV industrial complex. If you’re unsure what to make of Facebook, Twitter and other such networks, then know this: being useful, entertaining, interesting, informative, educational and compelling softens attitudes and allows your audience to make an emotional investment in your brand. Letting your ideal potential customers join the dots on their own terms allows them to reach a positive conclusion about you. Whether you’re a brand or a local retail outlet, you achieve the desired results by putting together good content to help people. This is the entry requirement in today’s loud, brash world. Cut through the crap that’s out there. Think of winning hearts and minds and not just X amount of eyeballs on your adverts. Put yourself in someone else’s shoes for a moment. Instead of being attacked with indignant sales messages or aggressive slogans I’ll bet you prefer to participate in ideas, narratives and dialogue. If this is true don’t you think it’s a good idea to apply this mindset to your online audience? For decades brands have tried to have “conversations” with their audience, and social media literally allows that to occur. Pragmatic brands are capitalising on this in the most tasteful, agreeable ways, giving consumers a much preferred experience. If only the world at large would understand this! TV has murdered itself with it’s cheap, loud, clumsy attitude. 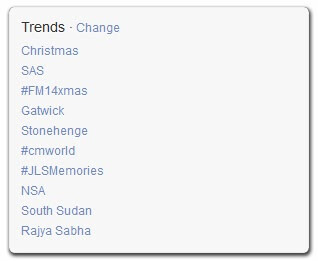 The fallout is corrupting social media because marketers try to imitate the kind of rubbish they see in TV ad breaks. In fact, TV and newspapers were invented for the sole purpose of displaying adverts. Some are better than others, but generally it is a broadcast medium in an increasingly social world, making the whole medium distinctly ANTIsocial. Another thing: television adverts ALWAYS get played louder than the programme content too, provoking an immediate negative responsive from the audience. I mute the TV and leave the room. When we use social media as casual users it is usually because we want to talk to friends and family. At the most social media activity consists of deeply meaningful interactions. At the very least it is passive entertainment and distraction. Either way, it is not an ideal selling context. When we browse a newspaper classified section it is because we do want to make purchases. When we use a search engine, it is because we want a solution to a problem. When we dial a fast food delivery restaurant it is because we are hungry. The point is not to tread lightly if bringing a selling mentality to social media – the place where people are not in that frame of mind. Generally speaking you must earn a person’s trust and embrace the softly, softly approach. Of course, there are always exceptions if you know your market. Mainly, most marketers new to social media are too aggressive or off the mark. Naive businesses “try out” social media but usually end up spewing in-your-face-sales headlines. I’ve seen local businesses literally repost the same status update over and over again throughout the day. Thinking about it, they were probably using automation software to bash out these cookie cutter passages of copy and paste. These types of people fail to understand they are beating us to death with their irrelevant messages in the same psychological space as someone sharing treasured photos of their children and family. The best case scenario is that meaningless adverts/spam go largely unnoticed. The worst case is that crap adverts/spam are noticed AND resented. The outcome is that neither marketer nor consumer gets what they want. Everyone is unhappy. The successful brands using social media are consistently giving good content. 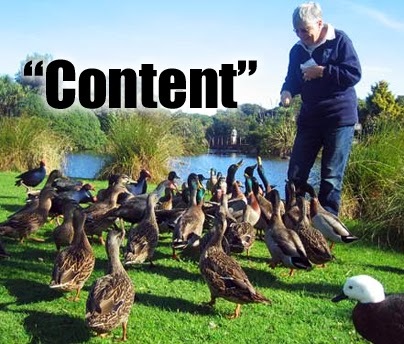 “Content” is that over-used word common to offices and marketing agencies worldwide. It is jargon for value. A business must leverage great content to the degree that they make themselves painfully useful to others, even taking the unprecedented step of subtracting the marketing message and not asking for the sale until you’ve given enough value. It’s like courting a woman. 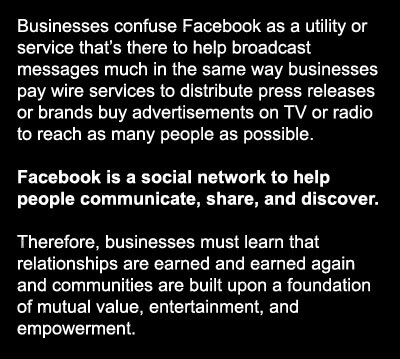 If you are a business using social media you can adopt this mindset and create real trust by proving you are not a grabber or a getter. And never worry that you didn’t get your marketing slogan in front of X number of eyeballs, because a few mouse clicks makes it easy for the curious consumer to trace your steps and find out which brands deliver real value. When it comes to social media, people love to talk! Some of the reasons for bad marketing online is that people either cannot or will not do what is required to formulate a proper strategy. It annoys me no end when I see lazy, thoughtless or aggressive headlines posted as every other status updates, but sometimes it is because businesses do not understand marketing. these are often the people who devote all their time to business operations and completely ignore the marketing. If you can make way for one or two hours a week to invest in social media, this is a good start. What you don’t want is to get carried away and end up wasting time on a bad strategy. 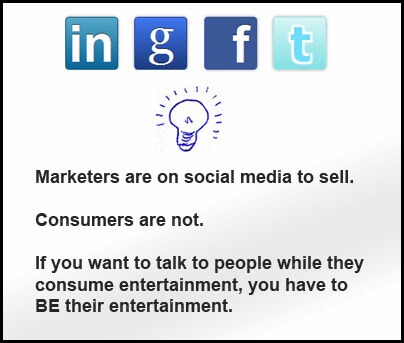 The other thing to consider is the fact your customers are already hanging out on social media. It is not negotiable. If you ignore this you are neglecting an opportunity to make deeply personal connections that can eventually turn profitable and give a return on investment (ROI). There are some tips at the end of this article to get you started in social media. While it is true you will be giving time and effort up front, think of your content as “material”. People talk, and internet marketing for your business is going on in the form of other people’s social media conversations whether you like it or not. What you can do is begin positively steering these conversations by taking control of the brand image through Facebook, Twitter etc. You’re not being asked to give away trade secrets or names of suppliers either; you’re simply looking for novel and interesting ways to connect with the audience. If you cannot produce content, you’re more or less admitting you have nothing of value to offer, in which case, why should anyone buy what you’re selling? If you put your mind to it, you’ll probably realise there are dozens of ways in which you can prove you know your stuff. It isn’t all about writing. You can use Soundcloud and free audio podcasting to literally have that conversation. If you struggle to come up with ideas, seek out someone who can help you and pay them to consult with you. It is an investment in your brand’s message. And everyone is conveying a message of some kind. Your brand has a kind of body language. Offline and online word of mouth work together particularly well in a small town or city because there is plenty of relevance. 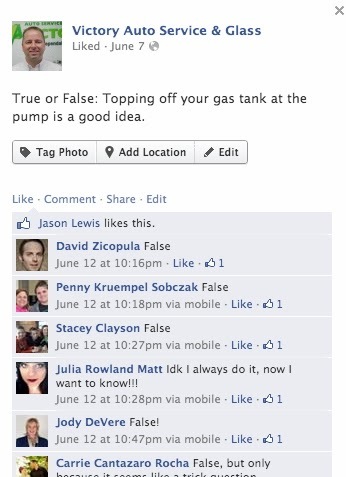 People talk in real life: social media is like fuel and content is the fire. I run various online local community websites integrated with social media platforms to help build up a good reputation. These websites and communities are set up as information resources. These sites are all about one thing… useful content. 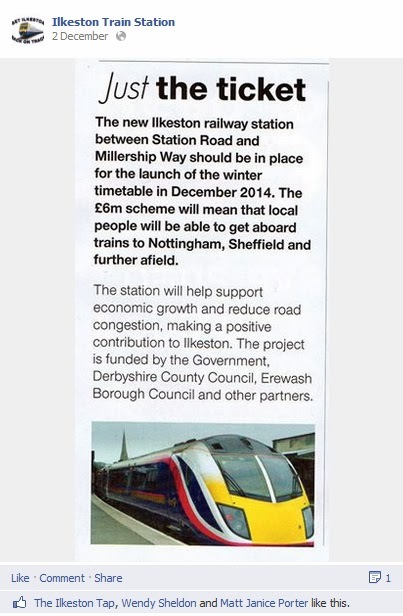 Myself and a work associate run a small Facebook group about the construction of our new local railway station. It is a great way to practice pleasing people with something interesting. You must occupy the warm fuzzy part in a person’s mind. This is usually closely guarded from marketers/brands and yet almost certainly open to someone with whom we can relate. Deliberately making someone else’s life easier resonates in ways the newspaper ad mentality cannot. Give consumers what they want… and then what they need. Check out this article in which an automotive repair shop has successfully connected with customers using YouTube content. 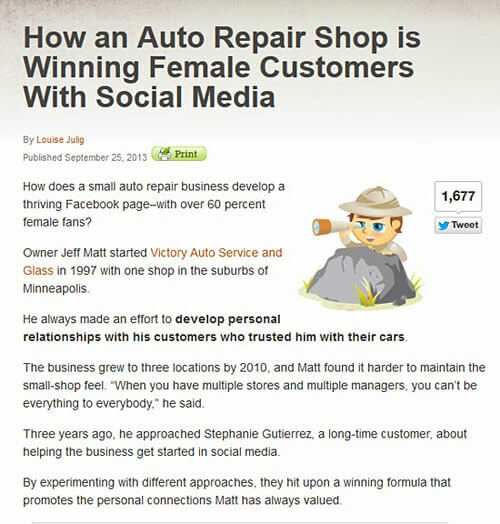 This auto-shop video utility strategy has been so successful it was featured on the world renowned Social Media Examiner website and held up as a fine example of modern marketing within a small business. The video from the article is embedded below. This is the antithesis of the loud broadcast style of advertising that finds its way into marketing channels. Let the video below inspire you to think of ways to truly put the social into social media. We already know the traditional print and TV media does not tell stories, it sells stories. Now, this is something we CAN put to good use if we do it tastefully and meaningfully. Omnipresent narratives like politics, religion and war is an ongoing global conversation and we’ll never hear the end of it. Then there’s X Factor and American Idol. 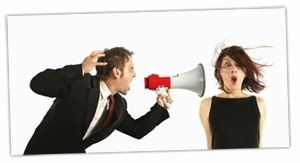 Why should people talk/listen to you? How is your ideal audience using social media? What conversations are they already having? While you might not want to get involved in heavy topics of conversation, you can tap into other narratives for the purposes of adding your own commentary. This kind of conversational content is about laying the seeds of relationship building. If you can do this as a brand you are able to ingratiate yourself and what you represent online. To put it another way, think of any time you are late to a party and you don’t know anyone. Do you immediately begin talking loudly, alone, hoping someone will take an interest in you? No, you approach other people and contribute value to an existing conversation. We are social creatures by our nature and these new fangled networking reflects this. The clue is in the title! Butfor goodness sake, actually BE social. Don’t be that drunk at the party broadcasting nonsense. Be the one who politely enquires and listens. One of the greatest lessons social media teaches is that a story always resonates. If stories are not interesting, then what is the movie business all about? Why do we watch terrible soaps? Why browse magazine gossip columns? There is an audience for just about anything if at the heart of it there exists what the consumer considers to be a compelling story. Pay attention to what is popular online and you’ll notice a heartwarming story from real life will always set social media networks alight. The best news stories from real life are the ones that come out of leftfield, the stories that cannot be engineered, fabricated, made up or manipulated. This beautiful story of a blind man and the dog that saved his life not only captured the imagination of users on the main social networks but resulted in enough cash being raised to cover the man’s health insurance predicament. This act of kindness is allowing Cecil Williams, who fell onto subway track and escaped death, to be able to afford to keep Orlando, a seeing eye dog for the blind. 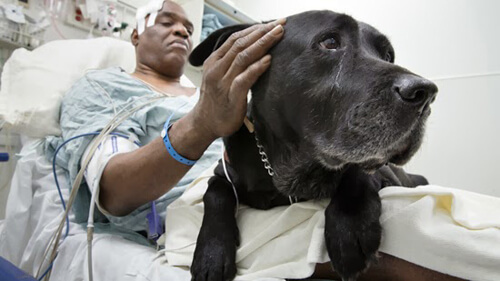 Cecil Williams avoided death thanks to his seeing eye dog. The story blew up on social networks. When you begin your social media marketing activity, look objectively at your business messages and think what exactly you are bringing to the table. How are you going to cut through the noise? Do you just want to be popular or genuinely appreciated? Are numbers more important than individual people? 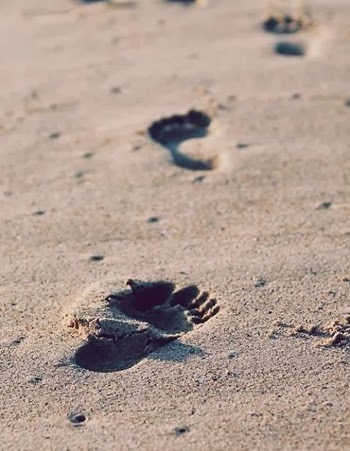 Think long term, and consider beginning the journey by Following, Liking, Sharing, Retweeting and generally getting on the radar of others in your sphere. In life, most people are starving for recognition themselves, so take the initiative and be the one who makes the first move. People love a little love and attention. Many (though not all) will reciprocate by checking out your stuff when you post something. The main takeaway is really all about being decent, helpful, problem solving and friendly. You must be emotionally present if you’re working Facebook, Twitter or whatever. There are times when a day’s work is just commenting and sharing information with others. It doesn’t earn you an immediate income, rather it is like paying into a rainy day fund or chucking pennies in a wishing well. It makes me believe in karma because I see this effort paying off. The tortoise is slowly beating the hare in the marathon. In marketing this is referred to as “social capital” and is a philosophical slant on general camaraderie. There are now industries dedicated to the social tech component of our lives. There are hundreds of thousands of fascinating scientific studies on our psyche. 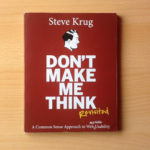 I find it useful to read books on human psychology and then apply the principles to technology. Man meets machine. Be useful, informative, educational, informative and compelling. Stories and narratives go down well on social media. Social media marketing about businesses can take the form of other people’s status updates and their opinions. If you do use traditional advertising, experiment by funneling a targeted audience to your social media and website. You could design offline QR codes that link through to your website or social media. Looking to run a special offer? How about every person who joins your Facebook page gets entered into a raffle? It gives people something to Like and Share. Use your social media networks to connect with and follow other local businesses. You do not need to engage with competitors. Find a way to use YouTube as part of your marketing. Videos are very “shareable” and easy to consume within social media networks. Google Plus Local is great for shops, stores or brands operating in a town, city or geographic location. When it comes to social sites, be careful about putting all your eggs in one basket.